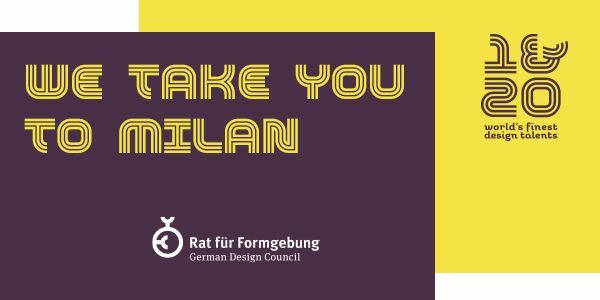 Calling design students and graduates from all over the world – registrations are now open for ‘ein&zwanzig’. Enter your innovative, pioneering work in the fields of furniture, home accessories, lighting, floor covering, wallpaper, textiles and lifestyle. The German Design Council enables the winners to take part in the world’s most important design event and to establish contact with members of the GDC’s unique network, who can offer them ongoing opportunities. Andrej Kupetz, CEO of the German Design Council, explained the significance of this competition: ‘Ein&zwanzig is right at the heart of our core mission: to foster new talent while promoting good design internationally.’ Not only is participation in this competition free of charge – the German Design Council also provides the young talents access to its key assets: its international networks and professional communication on an international platform. After the high-profile exhibitions of the winning projects in Milan in 2017 and 2018, designed by Hamburg-based Studio Besau-Marguerre and the Danish designer Nina Bruun respectively, a prominent design studio will once again draw plenty of attention to the young designers’ work in 2019 as well: Studiopepe, founded in 2006 in Milan by the designers Arianna Lelli Mami and Chiara Di Pinto, known not only for their iconographic designs but also for their experimental, multidisciplinary approach.